According to NBC's Nightly News, Zimmerman had a run-in with police years before shooting Martin more than a month ago. The Florida native was arrested in Orlando in 2005 for "obstructing justice" and "resisting an officer with violence" during an alcohol-control arrest at a college bar. 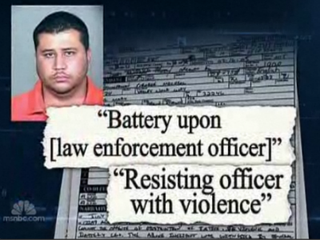 Zimmerman's actions resulted in a misdemeanor charge and court-ordered anger-management classes.